Immediately after you make a decision about the future of the Institute in Powering Up you’ll receive this quest. Speak to Father - for once he wanders around a little, though I found him leaving Institute Advance Systems - and he’ll order you to kill Desdemona, the head of the Railroad. Yikes. Despite what you say, he’ll make it an order and leave, so there’s no fear of changing loyalties yet. Talk to Desdemona and tell her that you’re there to destroy the Railroad. Everyone in the room will instantly become hostile. Not the best choice. Talk to Desdemona and tell her you’ve been ordered to kill her, but remain loyal to the Railroad. Their missions will continue, and eventually you will sever ties with the Institute. This quest remains open until your disloyalty becomes obvious. Attack Desdemona without getting close to her. This is probably the smartest way to do things if you plan to fight, as you’ll get the drop on everyone and not start out surrounded by unfriendlies. Come in with the intent to kill - and X6-88. This is a good choice for anyone who relies on companions, as X6 will immediately turn the Railroad against you en masse. 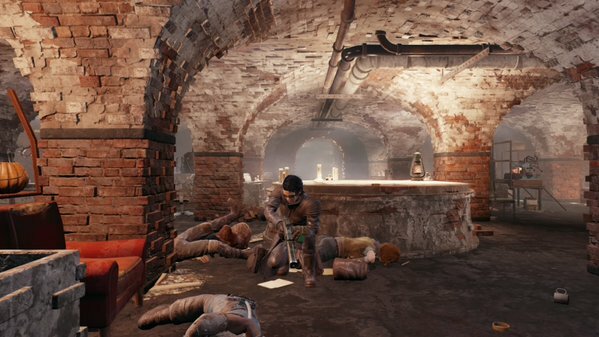 Most other companions will probably just hate your guts for turning on the Railroad, and may even join the fight against you rather than helping. Assuming you decide to take on the Railroad, you have a fair fight on you. There’s a large number of them in Railroad HQ, and as soon as Desdemona goes down they will all turn hostile. Several have Miniguns. Bad thing. The easiest way to take them out is to skulk in the entry hall, snipe as many as you can before they notice you, and then chuck grenades into the room while pouring on firepower. None of them have grenades of their own, so you don’t have to worry about explosives, and the amount of space available for them to target you here also limits how many can get at you at once. Return to the Institute after taking them down and speak to Father to end the quest. You’ll earn yourself one final challenge for the main quest line: Airship Down. Three guesses what you’ll be doing.